The volume of water is a constant. 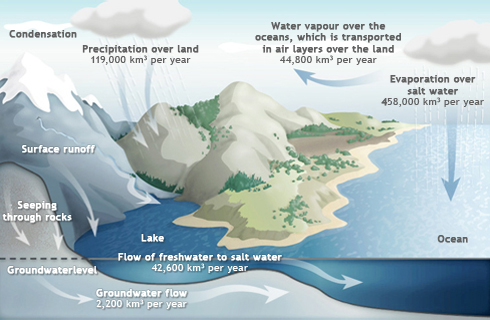 Approximately 1386 million cubic kilometres of water are permanently in motion. Through solar radiation, which converts liquid water into water vapour, it evaporates from the surface of land and water. Humidity stored in vegetation is also released into the air (evapotranspiration). With increasing temperatures the air can absorb increasing quantities of water vapour, which is the basis of the water cycle. The water vapour in the atmosphere condenses into drops of water. From these, clouds are formed and rain eventually falls. It is essential for our survival that part of the water that evaporates from the oceans falls on the land, feeds the rivers, waters the soil and fills up groundwater aquifers.